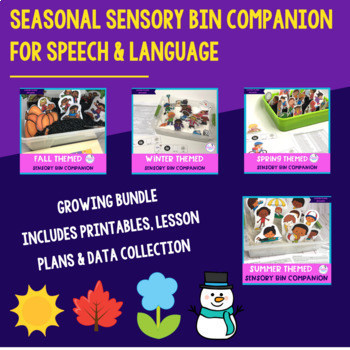 This is a bundle resource of seasonal sensory bin companion for speech and language for the following seasons: Fall, Winter, Spring, & Summer. Included in this companion are lesson plans for using the seasonal sensory bins. Students can learn new seasonal themed vocabulary while having a tactile, hands on experience. The Fall, Winter, Spring and Summer Sensory Bin companions are included in this bundle. This is a winzip file. You need an unzipping program to get the individual PDF files for this resource. You save 10% when you purchase this as a bundle. The seasonal sensory bin companions are available to purchase individually if you only want 1-2 seasons. Who this resource is for - This resource is designed for speech pathologists to use with students to work on articulation, fluency, grammar, language and social skills with a fall themed unit. Target attributes - Describe the items in the bin with adjectives and descriptive language. Compare/contrast how the items are similar and different. Talk about how the items feel, look, smell, etc. Describe the children doing seasonal activities by attributes of the color, shape, size. Target story narration & sequencing – Have students create a story using the kids and seasonal themed vocabulary. Receptively, can create a story and then ask the students wh-questions about your short story. Other skills to target with this activity: summarizing, main idea, conjunctions, dialog, prepositional phrases, and adding a new ending to the story. Target social language - Work on joint attention, initiating requests, making comments, sharing opinions, turn taking, and pretend play. Also, work on tone of voice or voice volume. To see what the sensory bins look like, check out the fall and winter themed sensory bin.